The December Newsletter is now available to view online. It focusses on our Guided Walking Calendar. Our Guided Walking Holiday in the Auvergne in August is now confirmed to go ahead with places still available. Congratulations to B.Wombwell, Berkshire, on winning a copy of Sasha Harding's ' A Brush with the Coast'. Our brochures have now been sent out. If you have not received one, but would like one, please fill out a brochure request with your details. Congratulations to La Villa Toscana on winning our Accommodation of the Year. Well deserved. We use our customer feedback, along with our own experience to judge all our accommodation providers for the quality and service that meet the High Point philosophy. Please use the evaluation forms after your holiday to tell us about those special places and their hosts that have exceeded all expectations. Or drop us an e-mail and nominate your favourite. 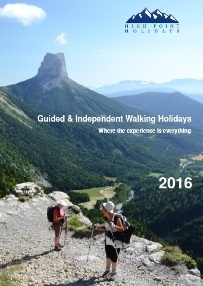 Our 2016 Walking Holidays Brochure is now complete and can now be viewed online. Paper copies are being sent out at the end of this week (w/c 16th Nov) to recent enquiries and customers. If you do not receive one but would like a copy please contact us and let us know. We have a new competition to win a copy of Britain's Highest Mountain Walks by Jeremy Ashcroft, which features all the England and Wales peaks over 3000ft and those in Scotland over 4000ft. Our new dates and new guided walks for 2016 are now on the website. Our latest newsletter is now available to view online, it focusses on the South West Coast Path in England and gives an update on where we are with guided and self guided holidays for 2016 and news on the 2016 brochure. Congratulations to A. Wilson, Edinburgh on winning a copy of the poetry anthology Ode to the Sea. We have a competition to win a signed copy of artist Sasha Harding's book A Brush with The Coast - An Artist's Search for Inspiration Along the South West Coast Path plus she kindly wrote a guest blog for us on why walking on the coast inspires her so much. Our latest blog is all about the joys of Walking in the Woods and is inspired mainly by the writings of John Stewart Collis who worked for a short time in the woods above Ashmore near the Compton Abbas airfield on the Cranborne Chase. Our latest newsletter (Autumn edition) is now available to view online. It focusses on Brittany's Emerald Coast. 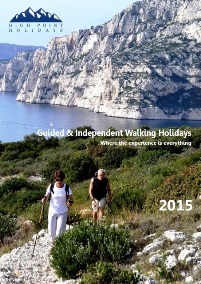 Early Bird Offer for those thinking of booking a self guided walking holiday for 2016. If you book before end of October 2015, you will pay at 2015 prices; we guarantee that the price will not go up with any subsequent price changes. Our summer newsletter is available to view online, it focusses on walking in the Auvergne and its amazing volcanoes. It also has a recap of the news that you see below under July. This month sadly saw the passing away of Tony Armstrong, one of the founding partners of High Point Holidays. As the father of the remaining partners, William and Mark, he will be greatly missed. He was a major inspiration for the company as it was him that first took his sons to walk in the hills, as his father had done before him. You can read William's tribute to Tony here. Over the coming months the address and phone number for High Point Holidays will be changing. But please do not worry whether you have the most up to date address as both will be used until the launch of the new brochure later in the year. But please note, all e-mail addresses will remain the same. Our Spring Newsletter is available to view online, it focusses on our self guided walking holidays helping you to decide what you want to see, as well as where and when. Congratulations to D. Blythe, Lincolnshire; L. Forster, Carlisle; and H. Harris, Sheffield on winning copies of "15 Minute French - Learn in Just 12 Weeks" Book Competition. Congratulations to G. Ashworth, Leicestershire and R. Bolwell, Hampshire on winning copies of Vertebrate publishing's High Point, a guide to Britain's 85 county summits. 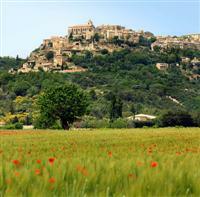 High Point Holidays are busy this month checking footpaths and trails in the Luberon, Tarn and Wiltshire countryside ahead of self guided walking holidays. Lots of work being done on our current website in preparation for a new look site, take a look at the French website to get some idea of the new look. During this time, do let us know if any of our page links don't work etc. February's Newsletter is available to view online and focusses on the Beaujolais Discovery and looks at our new French sister website Randonnees Outre Manche. Our Guided Walking Holiday Beaujolais Discovery for the dates 9th -16th May 2015 is confirmed as going ahead and there are still spaces available. Updates on our Guided Walking Holidays: Beaujolais Discovery is now Fully Booked for 19th - 26th September 2015. Amazing Auvergne is now Fully Booked for 29th August - 5th September 2015. January's Newsletter has been sent out to all our subscribers. 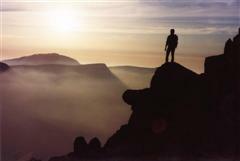 It focusses on our holiday accommodation and has updates on our Guided Walking Holidays. New competition to win a copy of Mark Clarke's book High Point, a guide to walking the summits of Great Britain's 85 historic counties, courtesy of Vertebrate Publishing. Closing date is 31st March 2015. If you would like a hard copy of our 2015 High Point Holidays Walking Holiday Brochure, please go to the Contact us page and fill in your details, selecting "order a brochure" in the drop-down menu, and we will send you a copy by post.